Social media replaces dating services in some countries. Regional dating sites often compete with large social networks as the go-to place for users to find romantic connections. Online dating can seem totally impenetrable whether you’re a spectator or a participant. There are so many dating services that it’s hard to know where to start. And according to a survey by the mobile rewards platform Jana, services explicitly intended for matchmaking aren’t the only ones you have to consider. In many countries, general-interest social networks are hotbeds of online love connections. Jana surveyed 1,500 18- to 30-year-olds in nine countries—Brazil, India, Indonesia, Kenya, Mexico, Nigeria, the Philippines, South Africa, and Vietnam—to find out which services people in each place favor for online dating. In all of them, Facebook came in at No. 1. Twitter was often a top contender as well. Furthermore, international dating sites like Match.com and Badoo did well against regional dating sites like Shaadi in India. The question seems to be whether people want the anonymity of a closed service just for dating or the reach of a widespread social network. And since the online dating industry is worth about $2 billion worldwide, there’s big money at stake here for developers. 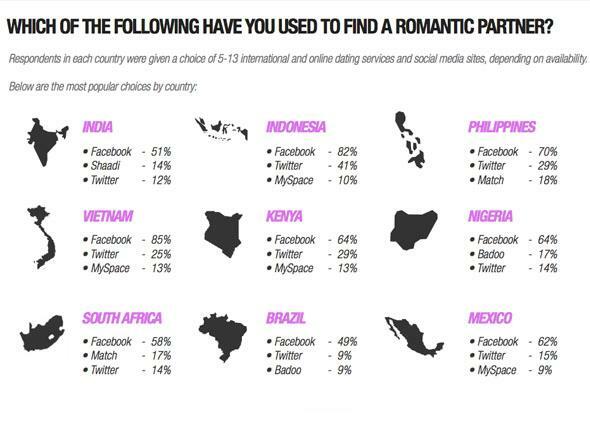 It’s also interesting, though, to look at which countries have a significant culture around online dating in the first place (see below) or not, and which services people in those countries are favoring. There’s more to life than OKCupid. Who knew? An important factor in understanding the significance of which populations use which dating services is the context of how people feel about online dating in general in a particular region.